Preservation: We share with all libraries the responsibility of preserving the cultural and intellectual legacy of human endeavor and knowledge for current and future use, particularly those materials that speak to the University’s history, Catholic mission and tradition of service. Seton Hall University Libraries’ Strategic Plan Objectives 19 and 22 (see Appendix A) point to the need for more robust digital collections services, including a digital preservation program to share “selected Seton Hall assets to highlight the University, mission, and depth of resources.” This document addresses the requirements needed to achieve these goals, with the long-term aim of ensuring that born- and created-digital information is accessible and preserved for future access. Additionally, any serious grant or fundraising activity around digitization will be predicated on this infrastructure being in place. In spring 2016, Dr. John Buschman, Dean of University Libraries, charged Elizabeth Leonard, Assistant Dean of Information Technologies and Collections Services, Prof. Sharon Ince, Digital Services Librarian, and Prof. Amanda Mita, Technical Services Librarian for Archives, with performing a thorough review and assessment of the current state of Digital Collections services for the University Libraries, as well as suggesting systems to address shortfalls and create a plan that would allow SHU Libraries to grow its Digital Collections capacities over the next five years. While reviewing existing digital operations and tools for SHU Libraries, the team was mindful of both the University Strategic Directions and the University Libraries Strategic Plan Goal and current Objectives (see Appendix A). Archives and Special Collections and Gallery/Museum Collections need public access systems for online exhibitions (Univ SD 2.4.11-12; Lib Obj 19-20,22; Lib Goals 1-5, 7-9). The existing digital asset management software, CONTENTdm, has been used for nearly 8 years without any major enhancements from the hosted vendor OCLC, and the pricing structure relative to the collection volume is high. As products are developed, alternatives will be considered that possess a better pricing structure, ease of use, development timeline, and enhanced end-user experience (Univ SD 2.4.11, 2.4.12; Lib Obj 17-19; G 1-3, 9). We are codifying and implementing both a Digitized Collections Policy and a Digital Preservation/Curation Policy, as none currently exist. These documents will help guide University Libraries in the selection, creation, and preservation of digital collections. (Univ SD 2.4.11, 2.4.12; Lib Obj 17, 19, 22; G 1-3, 5, 7, 8). To implement the SHU Libraries’ Strategic Plan, a position to manage and develop these tools – long in planning and budgeting – is currently in front of HRC for approval (Supports all University Strategic Directions and Library Goals & Objectives listed above). Provides storage, fixity, and current version of files, websites, email, etc. Maximizing the utility of our digital collections requires us to leverage the customizable functions of these systems. Therefore, the University Libraries has submitted to HRC a Digital Collections Projects Developer position. This position, reporting to the Assistant Dean of Information Technologies and Collections Services, will develop and implement digital library applications across multiple environments and operating platforms essential to University Libraries’ services and digital initiatives. Digital Preservation, as defined by University of Michigan Libraries, is “the management and maintenance of digital objects (the files, or groups of files, that contain information in digital form) so they can be accessed and used by future users”. Without digital preservation, digital objects eventually become inaccessible. 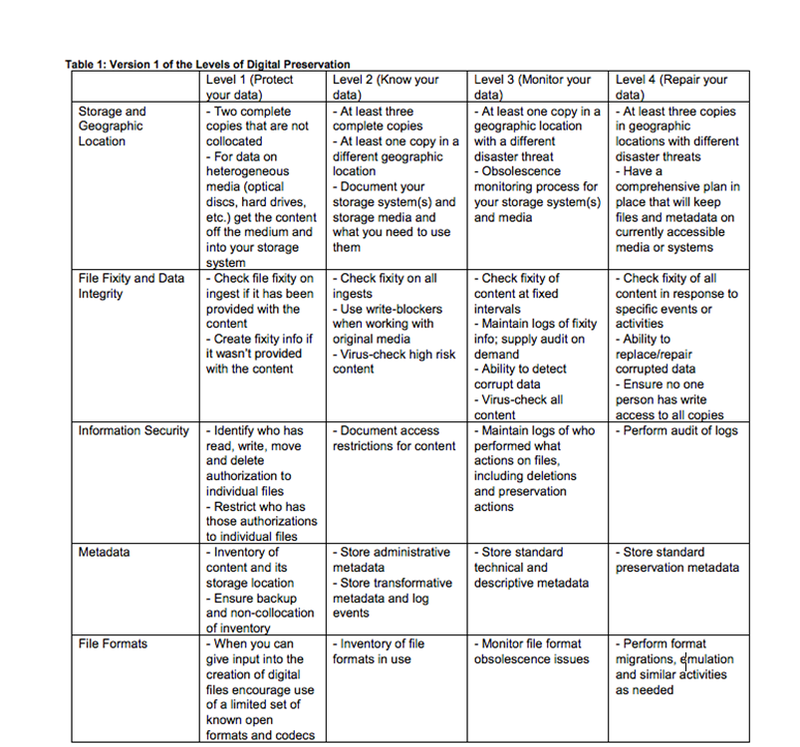 SHU Libraries’ existing digital preservation practices are at a National Digital Stewardship Alliance (NDSA) Level 1 (which is defined as protecting data) (see Appendix C for full table). Our goal is to increase digital preservation practices to Level 3-4 (defined as monitoring and repairing data). To move forward with current and future digitization projects, to begin collecting born-digital archival materials, and to secure grants, a more robust preservation plan and preservation software are needed. SHU Libraries has selected Preservica preservation software to help meet that goal. Preservica preservation software supports long term preservation (dark archive) and is compliant with OAIS (Open Archival Information System) supporting National Digital Stewardship Alliance (NDSA) level 4. The Preservica software contains a module for web archiving that can be used for capturing and preserving University websites and select e-mail communications (from the Seton Hall University President, Provost, the Seton Hall Newsletter, etc.) for the Archives. This, essentially, is the next step for university archives in the 21st century and needs to be performed before more of this content is lost. The University Libraries has opted to transition from Archivist’s Toolkit to ArchivesSpace, which will support such core services as accessioning, collection description and arrangement, and supports multiple metadata schemas as EAD, DC, METS. ArchivesSpace will be hosted locally and implemented between the summer and fall 2016. Upgrading to any new system necessarily entails data migration and negotiations with IT over server storage and maintenance. The Digital Services Planning Committee has not found a suitable replacement for CONTENTdm, and therefore has opted to keep it while looking for a suitable replacement. Alternatives with a better pricing structure, ease of use, and enhanced end-user experience will be considered. Omeka, an “open source web-publishing platform for the display of library, museum, archives, and scholarly collections and exhibitions,” [http://omeka.org/about/ ] has been identified as software that can support the library’s needs. This will enable us to produce more professional digital exhibitions (see Appendix B for a full list of open and completed projects) and more seamlessly utilize assets (finding aids, digitized objects) housed elsewhere. We are reviewing products that will allow the UL and the entire University to respond to the requirements of many grant making authorities to centrally preserve and manage research datasets. We have tentatively identified Tind (http://tind.io ) as an open-source, cloud managed product that can manage research data, and will consider implementing this or a similar product year two or three. * Estimate, based on the cost of implementing Omeka. ** Cost based on estimates of space needed; may increase. Projected Budget Year Two: Dependent upon product price increases; Preservica needs for Year Two are expected to grow from 4 Tb to 7+ Tb, which will incur at least $2,000 increase over Year One. Projected Year Three: Dependent upon product price increases; projected Preservica server needs to over 10 Tb, a minimum increase of $2,000 over Year Two. The Committee has developed a Policy for the Digitization of Collections that outlines the criteria that must be met before collections are digitized. See Appendix D for this document. SD 2.3: Enhance the culture of excellence in academics. SD 2.3.5: Strategically and disproportionately invest in the distinctive aspects of a Seton Hall undergraduate education including the core curriculum, servant leadership, Catholicity and student research. SD 2.4.11: Selectively invest in identified key support areas such as the library, technology, and academic advising. SD 2.4.12: Enhance existing structures that support academic excellence, scholarly activities, and research efforts, such as University Research Council, travel awards, sabbaticals. Univ SD 4.7.22: Communicate the importance of the Catholic identity and academics to the entire University community and all stakeholders via the web, all media and publications disseminated by the University. SD 6.12: Diversify and increase sources of revenue. D’Argenio Collection of Coins and Antiquities -– SPC in partnership with the Walsh Gallery, is processing and digitizing the D’Argenio Collection of Coins and Antiquities. The collection comprises 365 Greek, Roman, and Byzantine coins, as well as a number of antiquities and artifacts. The complete digitized collection, along with a number of digital exhibitions, will be housed in a local instance of Omeka. The project is ongoing. Galleon Yearbooks - in collaboration with Alumni Department, SHU Libraries is outsourcing digitization of 70+ Galleon Yearbooks. The yearbooks will be cataloged and uploaded to the SHU institutional repository, eRepository, and the InternetArchive for online open-access dissemination. The project will be completed in time for the Fall 2016 Gold Pirates reunion. Summer Institute for Priests - SHU Libraries is converting 1700+ cassettes to MP3 to be cataloged and made available via eRepository and InternetArchive for online open-access dissemination. This project is ongoing; release of first streaming materials is expected by Summer 2016. This policy is intended to guide the digitization of collections in the University Libraries as well as provide information to potential collaboration partners both on-campus and external to Seton Hall University. Appropriate metadata exists or there is a plan in place to produce it.